Considering the Super Bowl just happened, I am sure a lot of us spent the weekend eating our weight in food. I will say this because I am so proud of myself – I exercised TWICE on Sunday. Pre-eating and post-eating. 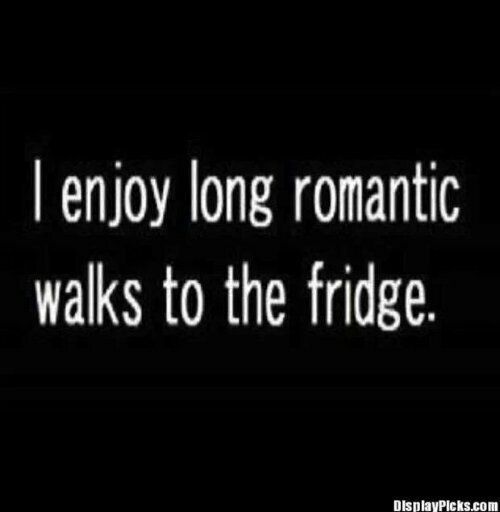 ;);) If you are like me, though, you are in need of some light meals to get yourself back on track! Last night I made a delicious cashew chicken stir fry for lettuce wraps (check back soon for that recipe – it is a winner! ), but this skinny fettuccine alfredo from Gimme Some Oven is one I whipped up the other week, but quite suitable to post now! I really enjoy that blog and I have rarely (if ever) been disappointed by a recipe of theirs that I have made. Homemade alfredo sauce is actually SUPER easy, especially if you lighten it up, because it contains ingredients you probably already have at home, namely chicken broth and milk). 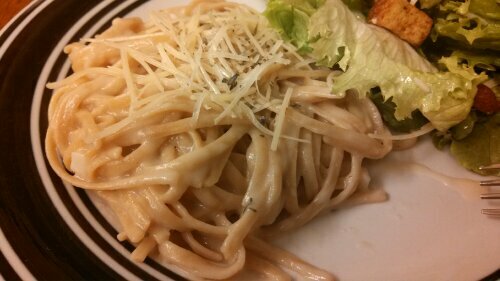 I have made alfredo sauces before, but primarily from heavy cream…hence why this is “skinny”! There is absolutely nothing wrong with this recipe. 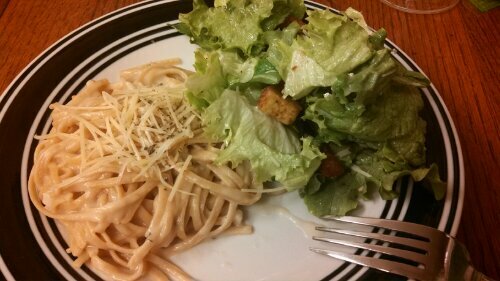 I paired it with a light Caesar salad – skinny, simple, and vegetarian dinner! You can easily add some sliced chicken to add some protein without packing on that many more calories, too. Health-factor: According to the original blogger, one serving is 450 calories. According to my calculations, one serving is about 330 calories (granted mine was more cuz I had slightly more than one serving of pasta). If you are counting calories or Weight Watchers points, remember to do your own math, as most brands or cooking styles can be slightly different! -Cook pasta al dente according to package directions. -Meanwhile, heat olive oil in a large pan or skillet over medium-high heat. Add garlic and saute one minute, stirring occasionally, until fragrant. Sprinkle with flour, and stir to combine. Saute for an additional minute to cook the flour, stirring occasionally. -Slowly add chicken broth, whisking to combine until smooth. Whisk in milk, and bring the mixture to a simmer. Let cook for an additional minute until thickened, then stir in Parmesan cheese until melted. -Reduce heat to medium-low until pasta reaches al dente. -Drain pasta, then immediately add pasta to the pan with alfredo sauce. Toss to combine. Serve topped with chopped fresh parsley if desired.